NOTE: Photograph at right is copyright Dr. Steven Goldsmith, used with permission. "Mountain Boomer" is a term with several different meanings. In the southeast U.S., it refers to "hillbilly" folk and the red squirrel. In the Pacific Northwest, it refers to a beaver-like rodent. Some varieties of apples are even called "mountain boomers." For purposes of our company name, "Mountain Boomer" refers to the 19th-century American settlers' name for the Eastern Collared Lizard, Crotaphytus collaris. Collared Lizards: genus Crotaphytus, from the Greek words krotaphos meaning "temple" or "side of the head" and phyton meaning "creature" or "animal." Thus, Crotaphytus can be taken to mean "a creature with impressive temples." While this may not mean much to a person who's never seen one of these lizards, after one glance at this animal's powerful jaws (for its size) it is easy to see why they are so named. Eastern Collared Lizard, or "Mountain Boomer:" Crotaphytus collaris, which means "a collared creature with impressive temples." Both the scientific name and the common name refer to prominent black and white bands, or "collars," on the lizard's neck. Collared lizards reach a total length of around 14 inches, most of which is tail. They come in a variety of colors, ranging from various shades of green and brown to a beautiful cobalt blue or yellow in some locales. The head is usually yellow to brown. Females, while usually more drab than the males, develop beautiful pink to orange markings when they are gravid with eggs. Interesting facts about this lizard include its ability to run on its hind legs like a little dinosaur and its eating habits--although primarily insectivorous, it will eat almost whatever will fit into its mouth, including other lizards! 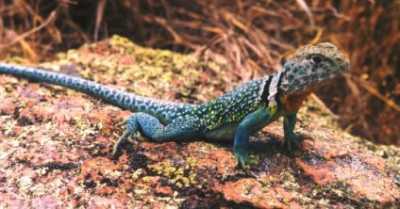 Collared lizards inhabit a wide range of habitat, with a preference for areas with rocky outcroppings. Males especially are territorial and can often be found spaced quite predictably, each perched on his lookout rock surveying his domain. On a positive note of human activity actually FAVORING animal habitat, with the advent of the US Army Corps of Engineers' water reservoir dam-building activities of the 20th century, many populations of collared lizards have found ideal habitat among the "rip-rap" of the boulders used to shore up the earthen embankments on either side of the dams. The early pioneers (and even some people today) thought collared lizards were poisonous, and called them "Mountain Boomers," presumably in the erroneous belief that these lizards were the source of unknown loud noises coming from rocky hillsides. Whatever those mysterious noises turned out to be, they weren't coming from the lizards, as they make no such loud noises. However, as contributor Bob Green notes, they are capable of hissing at passerby in defense of their territory. Another bit of folklore says collared lizards can predict rain, as mentioned on this site. The myth has been perpetuated that the source of the loud noises the settlers heard and erroneously attributed to these lizards was a frog. The Oklahoma Department of Wildlife Conservation makes this claim on its web site, as does Missouri's, and it's mentioned in countless reptile/amphibian field guides. The only problem is that the range of the amphibian suspects does not coincide with the pioneer overland trails, whereas the collared lizard's range does. Unfortunately, the origin of the "frog hypothesis" is unknown. Local residents in Oklahoma, Missouri, Texas, New Mexico, Utah, and Arkansas are known to still refer to collared lizards as mountain boomers. The owner of Mountain Boomer Music chose the name for our company in a moment of nostalgia for his native Oklahoma, where the collared lizard is the State Reptile. It's also a fitting name for a MIDI company, since MIDI files themselves don't produce sound--they're just a set of instructions for telling machines how to make music--although they are often mistakenly thought of as being sound files. This area contains links to other mountain boomer sites, and a gallery of pictures of mountain boomers organized by locale. If you'd like to contribute a photograph or a link (you'll receive full credit for the contribution and a link to your own website if you like), please email contributions@mountainboomer.com. Information on keeping collared lizards as pets (as well as some interesting pictures) can be found at Dr. Thomas A. Jones' Fancy Collared Lizards. He offers several species and subspecies for sale in a variety of colors. Robert Schumacher's site is written in German (although there are some sections in English; viewers can translate the page using BabelFish) and has some informative information on captive husbandry, and an outstanding satellite photo of the American Southwest with various collared lizard species' ranges superimposed. Mr. Schumacher recently wrote a book (in German) about the captive husbandry of collared lizards, and featured the Mountain Boomer Music logo as an example of collared lizard imagery in contemporary use. P.J. Bloemberg has a Netherlands collared lizard site, in Dutch and English, with pictures and captive care instructions--as well as great shots of his lizard enclosures. PhD candidate Jerry Husak has conducted a lot of research on collared lizards. SUBMISSIONS WELCOME! If you submit pics, please also provide the location as specific as practical where the lizard was found.